Tempo markers are used to synchronize your animation with a musical score. Using this feature, you can reproduce the FPB (Frames Per Beat) and the tempo signature as Tempo markers. The Xsheet view allows you to pace your animation according to the tempo or beat of your soundtrack music or to any rhythmical sound, such as the ticking of a clock or water leaking from a spout. 1. In the Xsheet view, right-click and select View > Set Tempo Marker. The Tempo Marker dialog box opens. 2. Reproduce the tempo and beat value of your music or sound for the Xsheet view marker display. ‣ Starting Frame: Type the number of the frame where you want the tempo markers to begin. 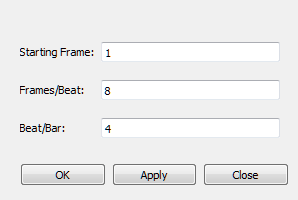 ‣ Frames/Beat: Set the Frames Per Beat value. 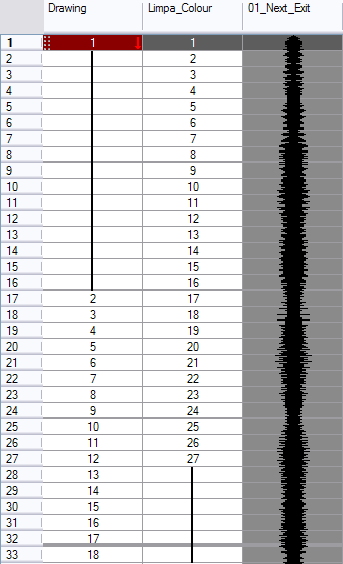 This will determine the frequency (in frames) a beat marker will appear. Keep in mind that, by default, 24 frames represent 1 second. ‣ Beat/Bar: Set the Tempo of your music or sound. This will determine the frequency (in beats) a tempo marker will appear in the Xsheet view.